The Twin Cities American Guild of Organists (TCAGO.org) is pleased to present EVENING VESPERS on Sunday, September 25, 2016 at 4:00 p.m. showcasing the Composition Competition-winning solo organ piece Elegy, by Brenda Portman. Chad Winterfeldt, Cantor of Christ Chapel at Gustavus Adolphus College in St. Peter, Minnesota, will lead the service on the three-manual, 31-rank, 1986 Schantz Organ at House of Prayer Lutheran Church (7625 CHICACO AVENUE, RICHFIELD, MN). 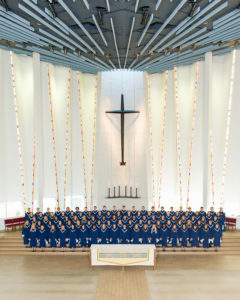 The service will be led by the 120-voice Choir of Christ Chapel from Gustavus Adolphus College, directed by Conductor Brandon Dean, with Christ Chapel Brass and Christ Chapel Ringers. TCAGO Dean Paul Westermeyer will preside. Following the service is a member dinner with the installation of officers. TCAGO members should register for dinner at TCAGO.org or Jeremy.Haug@mountcalvary.org (612-578-8058) by September 19 (for dinner only.) Cost for the dinner is $25. Brenda Portman is the resident organist at Hyde Park Community United Methodist Church in Cincinnati, where she provides music for worship services. She is also Adjunct Organ Instructor at Xavier University in Cincinnati. She recently completed a Doctor of Musical Arts degree (2016) in organ performance at the University of Cincinnati’s College-Conservatory of Music, where she received a full scholarship as first prize winner of the Strader Organ Competition and served as a teaching assistant for the organ department. Brandon Dean serves as Assistant Professor of Music and conductor of the Choir of Christ Chapel and Lucia Singers (80-voice women’s choir). In addition to his conducting duties, he also teaches courses in choral music education. Prior to his appointment at Gustavus Adolphus College, he completed the Doctor of Musical Arts degree in conducting from the University of Cincinnati College-Conservatory of Music. In 2014, Dr. Dean received the Swenson-Bunn Memorial Award for Teaching Excellence. Chad Winterfeldt serves the Gustavus community as Cantor of Christ Chapel. In that role, he works with both the Chaplain’s Office and the Department of Music to plan, lead and facilitate the musical and liturgical aspects of worship in the chapel. He teaches courses in church music and music theory, guides an active organ studio and directs three campus handbell ensembles. TCAGO Dean Paul Westermeyer is Emeritus Professor of Church Music at Luther Seminary in St. Paul, Minnesota, where he taught, served as the Cantor, and directed the Master of Sacred Music degree program with St. Olaf College. Prior to coming to Luther Seminary he was Professor of Music at Elmhurst College, Elmhurst, Illinois, where he chaired the Music Department, directed the College Choir and oratorio chorus, and taught courses in church music, hymnody, and worship. The TCAGO Fall Vespers on Sunday, September 25, 2016, will begin at 4:00 p.m. at House of Prayer Lutheran Church in Richfield. Organist Chad Winterfeldt and the Choir of Christ Chapel, conducted by Brandon Dean, will lead the service. The event is free and open to the public. For more information on local organ events, visiting performers and educational opportunities about the organ, go to www.TCAGO.org Membership in the TCAGO is open to all those interested in the organ.